For venues with in-house P.A., our tech spec is 2 vocal mics [sm58 or equivalent, or Neumann KMS], 1 instrument mic, and 4 D.I.inputs. We provide Orchid preamp D.I. Boxes for two of these so require only 2 D.I. Boxes on stage. 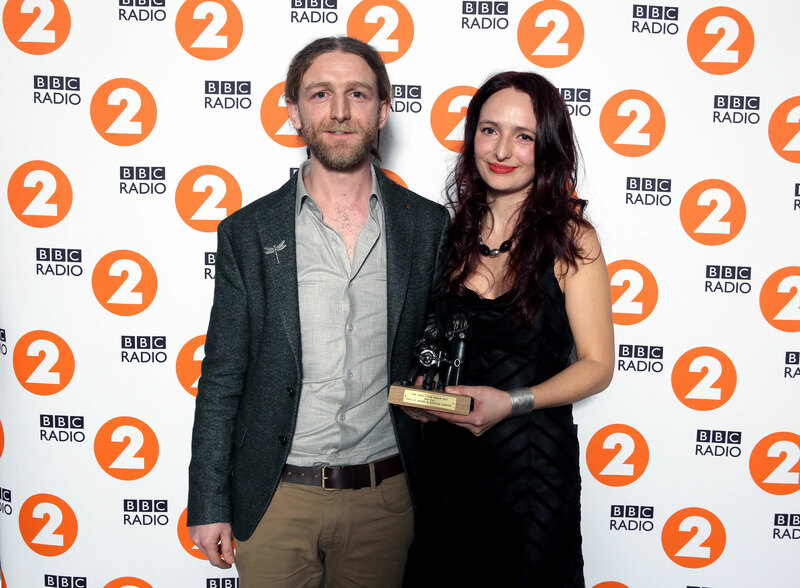 "Bright songs for dark times"
Phillip Henry and Hannah Martin have proved themselves one of the most captivating and innovative acoustic duos in the UK - winning the 'Best Duo' accolade at the 2014 BBC Radio 2 Folk Awards and being nominated for the same title again in both 2016 and 2018. It's a class act built on Henry's much extolled musicianship, Martin's highly original songwriting and her deep, soulful voice. 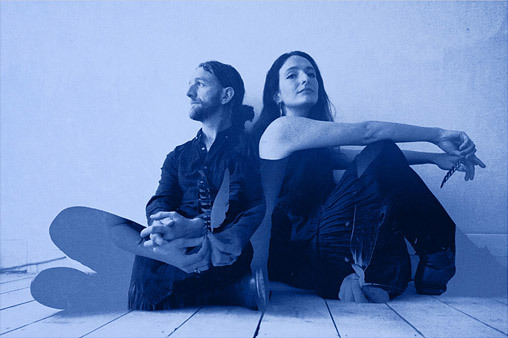 The Devon duo have been making 'world music from the West Country' since 2010 through four acclaimed studio albums - Singing the Bones, Mynd, Watershed and most recently, after re-naming their act, the eponymous Edgelarks, plus the 2014 live album Live in Calstock. Feather comprises 10 beguiling original songs and a unique take on a traditional English folk song. Henry again conjures incredible sounds on dobro, lap steel and beatbox harmonica, while Martin excels on banjo and fiddle and that wholly distinctive vocal. Stomp and shruti box augment the mix. Not only is it an album pumped full of peace and joie de vivre; it also sees Henry, following on from his 2018 solo album True North, stepping up his vocal presence. Pushing more musical boundaries, the fluttering Feather dips and dives managing at the same time to be graceful and majestic, fragile and strong, sometimes mystical, sometimes direct but always soul-stirring. The much travelled pair (tours have taken them to Australia, Japan, South Africa and Canada) said Feather was borne out of a creative block. Weary from the road they sought a retreat and were offered the use of a remote cottage in the west Cumbrian Lakes. Hannah says: "We went there in the spring and breathed in the mountain air. We turned off our phones, banked the fire, stocked the fridge and wrote. Having had no time or energy the stories and songs started to unfurl and we found that we were writing about hope. We had been lucky enough to experience kindness, solace, rest and welcome and these were now the things we wanted to sing about. We returned from Cumbria with a suitcase full of new material - songs of the hills, wild rain and sunshine and the circles of all things, songs for tired hearts and troubled minds." Produced by in-demand Mark Tucker (with Phillip Henry) at The Green Room in Devon they have encapsulated that idyll in this album of evocative songs - which features no guest musicians, just a multifaceted duo capable of sounding like a much bigger unit. Two songs are inspired by one of their favourite places - the vast, history-drenched moorland of Dartmoor. A lone feather in the middle of a stone circle on Dartmoor triggered the title song - a percussive, banjo driven opening track, showcasing the duo's sophisticated musicianship. The sublime, quivering Where I Stand was inspired by the Ogham stones (rune-like writing carved onto stone monuments that predominated in Ireland but spread through Wales and the West Country). The song was inspired by Dartmoor's Roborough Down stone which commemorates two people (one possibly a first generation Irish immigrant). 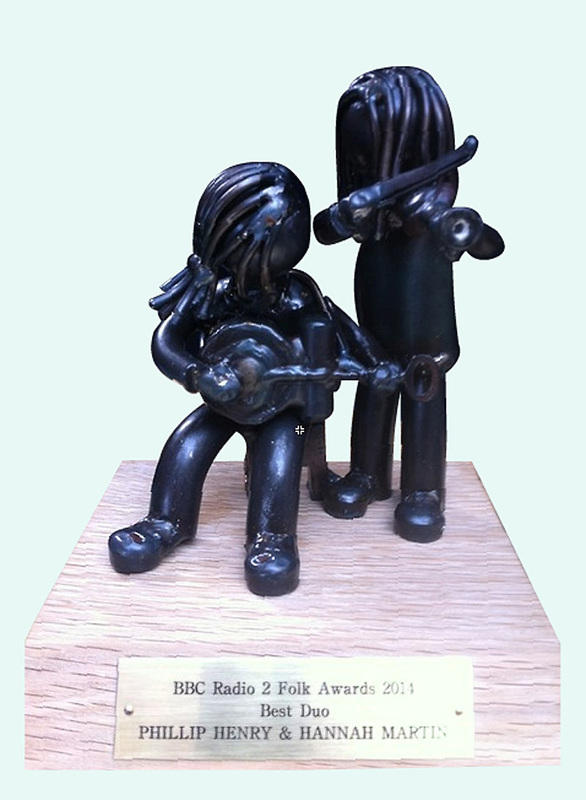 It has an underlying theme of migration -'the wind rushes through their lives' - with guitar and banjo interweaving and fluttering like butterflies. 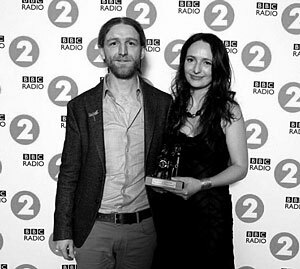 One of the stand-out songs on the album is the breezy and carefree Back from Hope with shared vocals and wonderfully expansive fiddle playing from Martin - basically a song about a city-based husband and wife who loved to hike the Peak District's white and dark hills "where we found our rest in walking all the day". 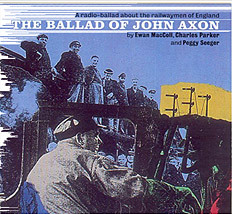 It's a song of contentment with image-rich lyrics though it masks a true tragic tale for the couple as told in the Radio Ballads 'Ballad of John Axon' - written in 1957 by the great Ewan MacColl and Peggy Seeger. Axon, a railwayman from Stockport, died whilst trying to stop a runaway freight train at Chapel-en-le-Frith and was posthumously awarded the George Cross. Contentment continues to permeate the music in Wanting Nothing as Henry's dobro and Martin's banjo lace the 'shut the world away' lyrics while the duo both turn to guitars on the slow-paced; 'beachcombing' song What We Save from the Tide, with its poetic parallels to the flotsam and jetsam of the creative process. In the hypnotic Oyster, the pair explore the hope that can be found in nature. "Here's to the lark, who sings out of the night", with a nod to Emily Dickinson's poem which begins "Hope is the thing with feathers that perches in the soul". Unusually this song finds Phil on banjo and Hannah on tenor guitar as it builds to a frenetic climax and an Indian mantra-like close. Time Away advocates the importance of holidays in loping rhythms that build into soaring strings and back to a beautiful suspended stillness. 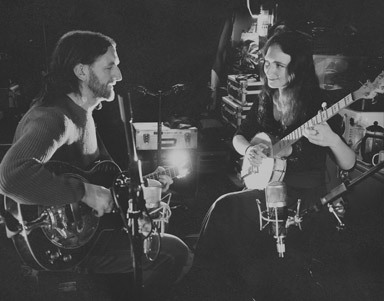 A small miracle is celebrated in the dobro and banjo driven Growing based on a true story, from Sweden, of a lost and found wedding ring while Wander is described as 'a song of belonging and welcome' and brings Henry's show-stopping beatbox harmonica to the album. It tells of the loss of regional accents and offers the thought that 'home' should be defined by individuals and the place they put down roots rather than by birthplace. The drone of the shruti underpins the one traditional song on the album - the much recorded Spencer the Rover. Henry and Martin's languid and atmospheric arrangement allows the lyrics to breathe through Martin's clear and mesmerising vocal. Album closer The Longest Day is inspired by the turning of the year and the promise of summer - the circle of solstices, equinoxes and traditions like dancing the sun up on May Day on Dartmoor. It's a dreamy, calming finale brimming with promise, the dancing fiddle mimicking the rising of the sun in a summer sky. 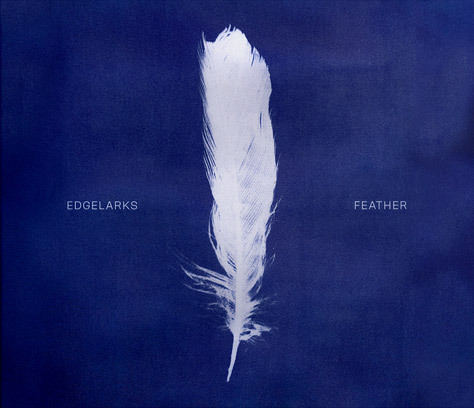 It completes an album that surely delivers what Edgelarks set out to achieve - to produce a collection of 'bright songs for dark days' , whether the darkness is perceived as seasonal or global. Feather is released on the Dragonfly Roots label on May 17 and distributed by Proper Music Distribution. 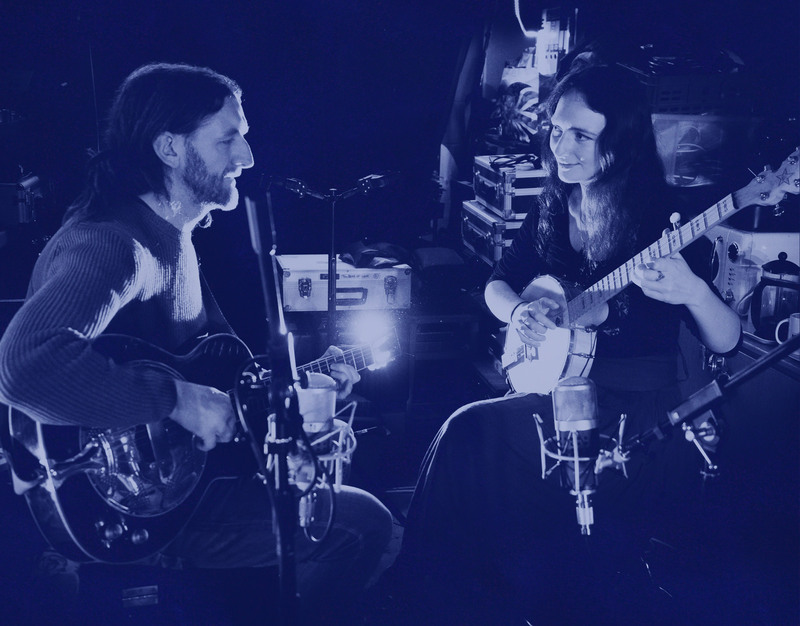 It will be showcased on an extensive 18-date UK tour starting May 16 at Bath's Chapel Arts Centre with a special album launch party at West Town Farm, near Exeter on Saturday, June 15. "One of the best duos on the planet"
"Rather fine, delicate and delicious - based in Devon but their songs resonate throughout these islands"
"Peerless musicianship - modern folk at its pinnacle"
"The musicianship is first rate; Martin's voice is sublime"
"Songs that linger in the memory held together by fine musicianship"